I looked at the reviews and maps of Massacre trail and honestly thought it would be easier than what it is. (Although, I do rate it I medium level hike.) I pretty much thought it was all going to be flat. But towards the end it gets steep – but nothing that is too extreme. Like I said I would rate this a medium level. There is a part (still early on in the flat part) where it dips down into a deep valley and then you hike back up. It’s soon after this part that you come across another fence that you go thru. Once through this passage you will see the most amazing rock formation ever! It’s really awesome because this rock formation has green moss over it, so it’s a really beautiful colorful site. After this point the trail turns into dirt and gravel that you walk on and begins to gradually go up. 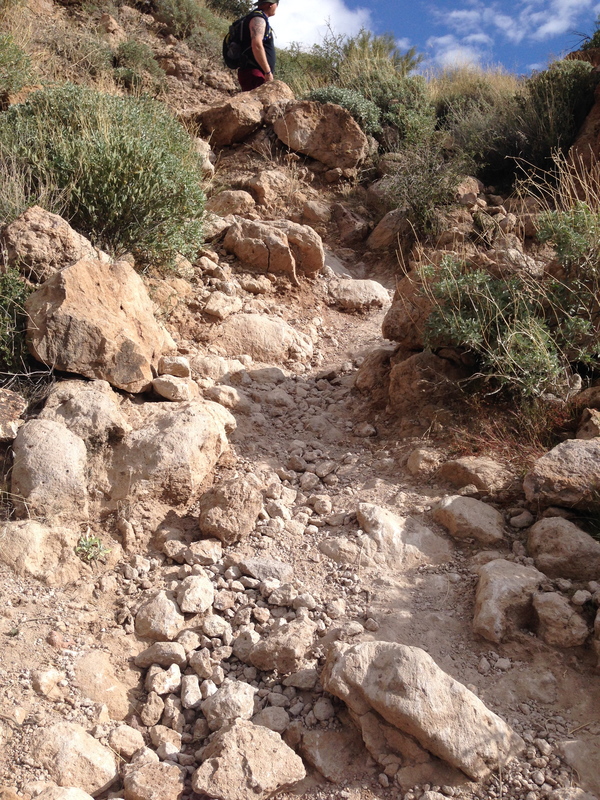 It will then turn into more of a rocky terrain and get steeper. Once you get to end of the trail, you will then realize that your on a cliff. It was a little scary, I was nervous to get to close to the edge, because it’s just straight down. But the cool thing is that towards the left there is a rock that has an indentation on the side. It’s a good place to sit and take in the view and eat your hiking snacks! Looking out on the opposite end of the cliff you will see Massacre Falls. From what I can gather you won’t actually see a waterfall unless there was a heavy storm that came thru. There wasn’t a heavy storm that came thru when we went, but the view of gorgeous regardless. Massacre Ground trail was very easy to follow and was marked clearly. I was surprised to find so many cairns on the trail to help lead the way. This hike took us around three hours to complete, although we weren’t moving the whole time. We stopped to take pictures and there were a few times we needed breaks. As a side note…be careful going down. I think going up you don’t realize just how steep it is, and going down was pretty dangerous. I fell down a rock and there were a few parts with loose rocks that I slide over while going down. So be careful! Also I would suggest wearing pants for this adventure. There are prickly pear cactus that are very close to the edge of the trail, especially near the end. It wasn’t a very crowded trail. We went on a Saturday morning and I would say throughout the entire time we saw about 20 people. Finding the area to park is pretty easy, but it was a little confusing on where to find the actual trailhead. You take the 60 East and turn left on Idaho road. Then turn right on highway 88 and follow that down until you see First Water Road on your right hand side. 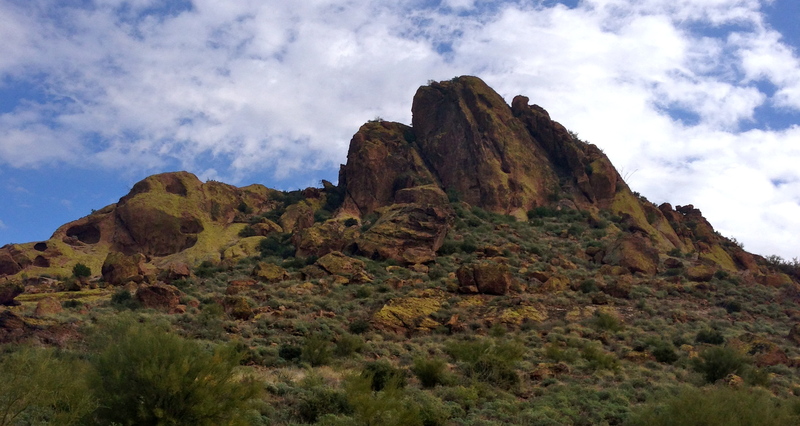 (You will pass the entrance to Lost Dutchman State Park and it’s located shortly after that). 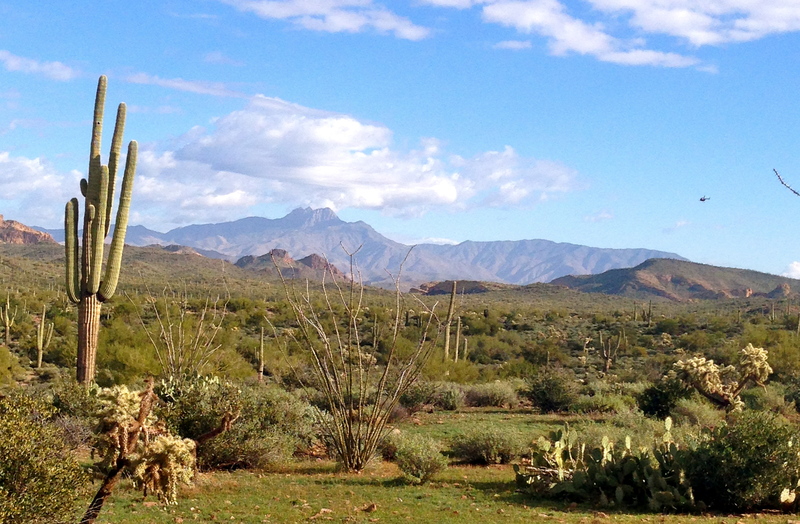 Continue along the dirt road until you see the sign for Crosscut Trail head on your right. As you park you will notice that the area is all fenced in. On the far right hand side there is a break in the fence you can walk thru. Now…here comes the tricky part! You’ll see a bulletin board with various hiking information on it, and a dirt trail with a sign. But this is not the trail. 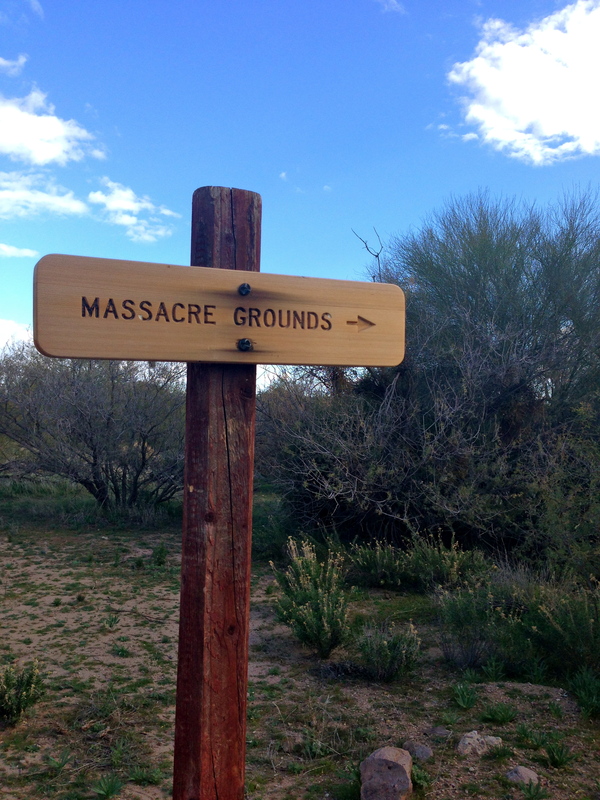 You will need to walk over to the left side and you will see another trailhead marker for the Massacre Grounds trail.